Due to weather, the music festival is moving indoors to the Lee County Middle/High School Auditorium at 599 Lee Avenue, Beattyville, KY 41311. Live entertainment all day starting at 1:30pm. Concessions and craft items from local vendors will be available for purchase.At dusk, there will be a Trail of Terror Haunted Hay Ride for all who dare take a ride around the haunted Happy Top trail. The trail dips down in to the woods and it is sparsely lit, so beware of what is waiting in the darkness between lamp posts. 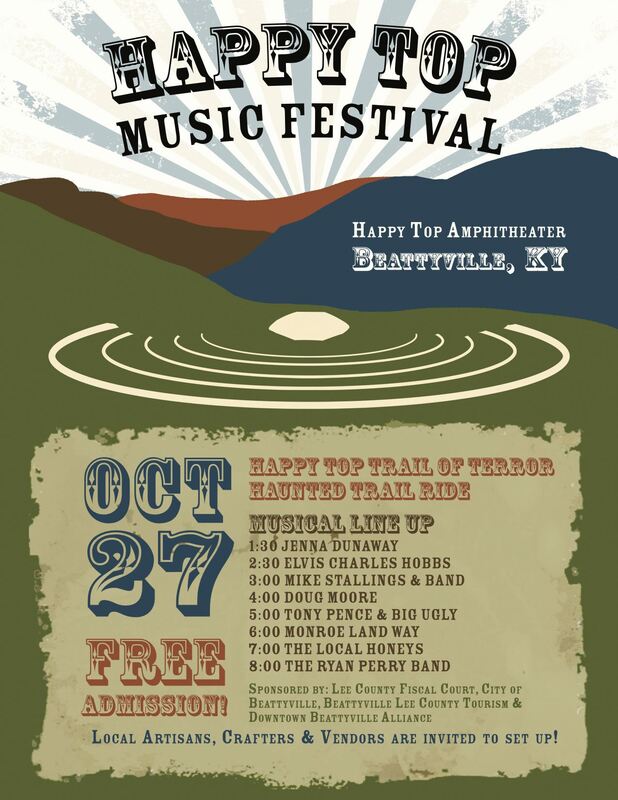 The music festival is free for the public to enjoy and made possible by the Lee County Fiscal Court along with sponsorship from the City of Beattyville, the Beattyville/Lee County Tourism Commission, and the Downtown Beattyville Alliance. If you are a local artisan and would like to set up please contact: Teresa Mays at (606) 464-5007 or by email tmays@beattyville.org or Dedra Brandenburg at (606) 464-5038 or email at info@heartofthekentuckyriver.com. ​​For more information about Billie Jean Osborne's Kentucky Opry or other shows and to order tickets, please call 1-888-MAC-ARTS (1-888-622-2787). Jenna Dunaway auditioned and was inducted into the Billie Jean Osborne's Kentucky Opry, the resident group of the Mountain Arts Center. The group presents a sizzling variety of country, bluegrass, oldies but goodies, and gospel favorites. BJOs Kentucky Junior Pros are a talented and versatile group of young musicians and singers. These performers, who range in ages from 6-16, represent the finest young talent in the region. Jenna Lee Dunaway, the daughter of Janet and Virgil Dunaway began singing in church when she was just six years old. Her first public and paid event was at last summer’s Main Street “Remember When” car show/cruise in hosted by the Downtown Beattyville Alliance and Lee County Tourism Commission. 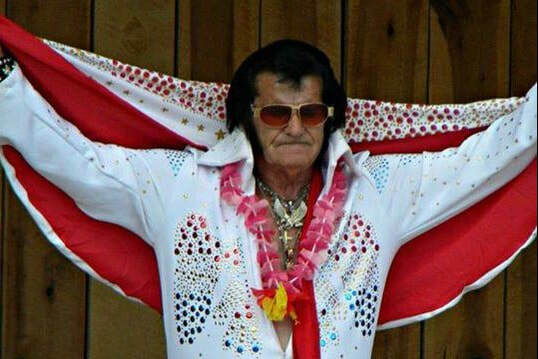 Charles Hobbs, of Beattyville, KY loved Elvis as a kid. Now the local community Elvis is bringing out all the stops to preform on the big stage at the Happy Top Music Festival. Hobbs has performed as Elvis many times over the years during the Woolly Worm Festival in Beattyville, KY.
Michael Stallings calls his home Estill County. 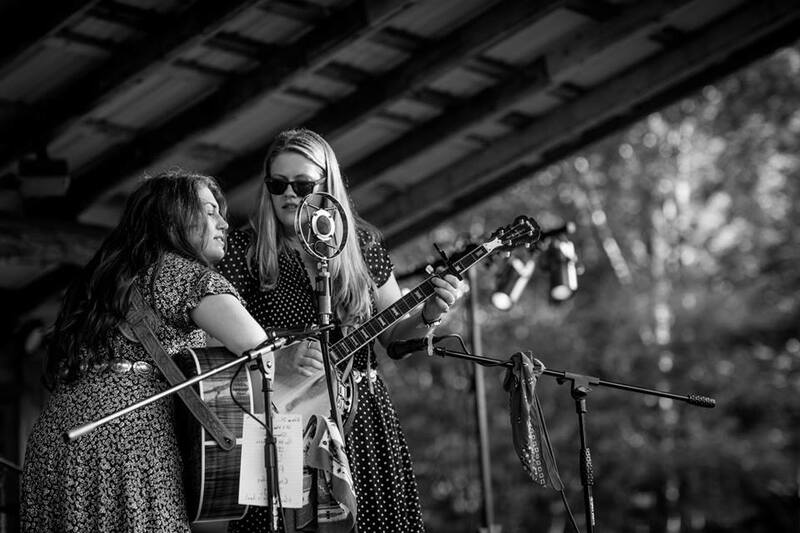 This musician is a new upcoming talent emerging into this Appalachian Music Movement. 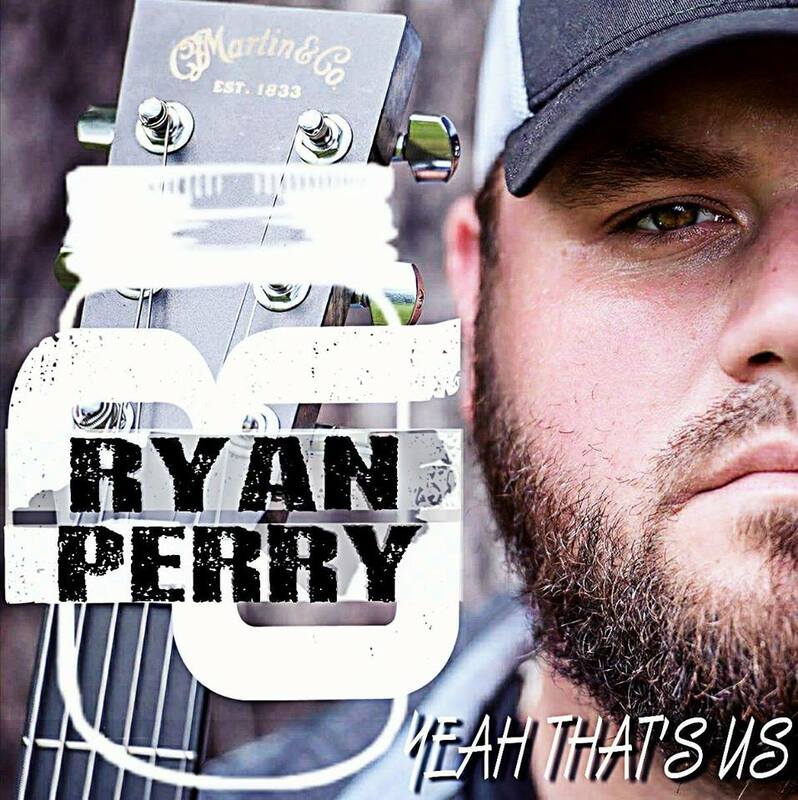 He has made music with many performers including Buck Windburn, Jennifer and Chris Shouse, and has shared the stage with Nick Jameson and Chelsea Nolan at Kickin It On The Creek 2017. Michael is currently Mandolin/Guitar/Vocals for Thump Keg Waltz. Michael along with Seth and Jonah Kershaw have a country bluesy, bluegrass feel that is proven to make you wiggle. Singer/Songwriter originally from Beattyville, KY, Doug Moore has been on the Happy Top Stage before in 2013 when he opened for Halfway to Hazard during the August Labor Day Weekend events. Moore has a authentic country rock crossover voice and a talented selection of songs for the crowd consisting of original songs as well as covers of some of your favorites! A 30 year veteran of the Country Music scene, Tony is a Songwriter and Singer with songs such as "Jack and Thelma" and "Someone I Used to Be" that have charted nationally and in Europe. Pence is a Hard edged Story teller who lives by the Harlan Howard motto, 3 Chords and the Truth! Monroe Land Way; consisting of cousins Jacob Fultz, Cameron Brown, and Todd Fultz; distill their small town Eastern Kentucky surroundings into a potent mix of alternative country roots music.